Michigan State University’s engineering program is rated one of the top in the United States, and is one of the largest and oldest colleges on the campus, presently comprised of eight departments, 16 research centers and facilities, 179 faculty, 439 active research grants, and over $52 million in research expenditures (in FY 2013-14). FRIB will be a state of the art machine, with unprecedented capabilities to study the fundamental structure of matter. The 4.5- and 2-Kelvin helium refrigeration systems supporting the superconducting accelerator will be state-of-the-art, supporting world-class physics research. It also has several additional modern helium refrigeration systems supporting laboratory test facilities. These operating systems will provide experiential learning for students, exposing them to a challenging operating environment while providing valuable workforce training. 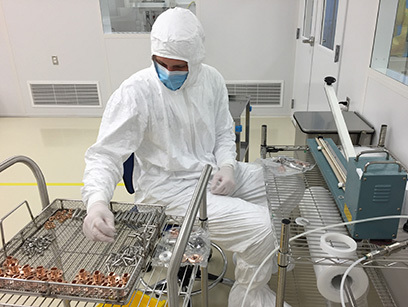 A substantial amount of infrastructure is being installed for this facility, along with many superconducting support technologies, including superconducting radio frequency, superconducting magnets, control systems, and detectors. Cryogenic engineering exposes students to fluid-dynamics and thermodynamics, as well as real fluid and wide-range material properties not encountered in industrial refrigeration. This requires a clear understanding of engineering principles, with an application of analysis ranging from back-of-the-envelope to complex simulation and modeling, and many opportunities for creative solutions. Cryogenic processes are complex thermal systems, as are the mechanical designs. Opportunities abound for students to clarify and refine their understanding of their engineering curriculum, exercise their analytical skills and creativity in design, and have a hands-on experience of hardware construction and implementation. This exposure and experience will be an asset in many potential engineering careers. Cryogenic engineering itself is a niche industry with high-paying job opportunities with a present need. Self-motivated, naturally curious, creative, practical, and analytical graduate students are attractive candidates for a fellowship. Under-graduate thermodynamics, fluid dynamics, heat transfer, materials engineering, mechanical design, and computer programming are prerequisites. Advanced coursework in any or all of these areas is highly desirable. In addition, exposure to exergy (availability) analysis, thermal systems modeling and analysis, and an introductory level understanding of accelerator systems are highly beneficial. The MSU Cryogenic Initiative will provide experiential learning for students, exposing them to a challenging operating environment while providing valuable workforce training.